"HORSES - Two Works to Welcome the New Year"
For the first two weeks of February, Shanghart opens an exhibition consisting of two works that welcome the Year of the Horse. Li Shan presents 'Horse' and Xue Song shows 'Liu Jun Tu' (Six Excellent Horses) in a celebration of the New Year. 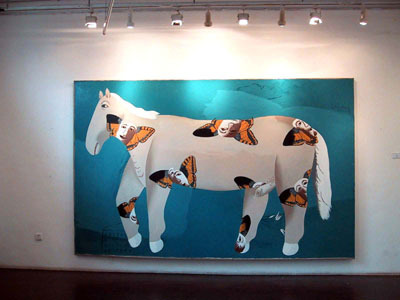 The beautifully fresh and uncomplicated painting of a horse with butterflies on blue background is one of the major works of the soon sixty-year old artist Li Shan. It is confronted in this minimal exhibition�with Xue Song's ''Six Excellent Horses' (liu jun tu) from 2000; Xue Song's masterful and witty reinterpretation of Xu Beihong's famous painting of six horses created over half a century ago.